POLICE are appealing for help in tracing a van driver who knocked down and killed one of the city’s beloved swans. It happened at Chichester Marina at around 10am on Monday, 1 June, when a resident mother swan, Flo, is said to have been killed as she slept with her cygnets. Local residents last week expressed their shock at the death of the much-loved animal. Kim Bird, a houseboat resident, said: “We are all totally devastated how someone could have done this and not even stopped. “Flo and her partner Ebb have been on this part of the canal for years and every year produce cygnets that I’m sure make up for half the local swan population around here. “She was a fantastic mum who would sit on her eggs through snow and rain and never left their side. “She was a daily visitor to our boats, tapping on our windows for scraps and a delight to visitors of the marina. 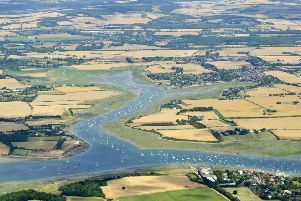 Despite repeated attempts to contact Premier Marinas, which run Chichester Marina, they have so far declined to comment. Wild unmarked swans on open water are the property of the Crown and to harm them may constitute a crime. Anyone with any information should contact police by emailing 101@sussex.pnn.police.uk or phoning 101, quoting serial 472 of 1/6.